Last week was a strange one for nail polish, I must have done them at least six times in two days. Partly because I wasn't well at the start of the week so couldn't do much besides paint my nails, and partly because it seemed that I couldn't manage to do all ten fingers without messing them up in some way, do you ever have days like that? Out of all of the polishes I had on my nails, this one from Barry M took the top spot. It's the polish that they made for Superdrug's 50th birthday and is limited edition, so if you want it I suggest you move quickly. 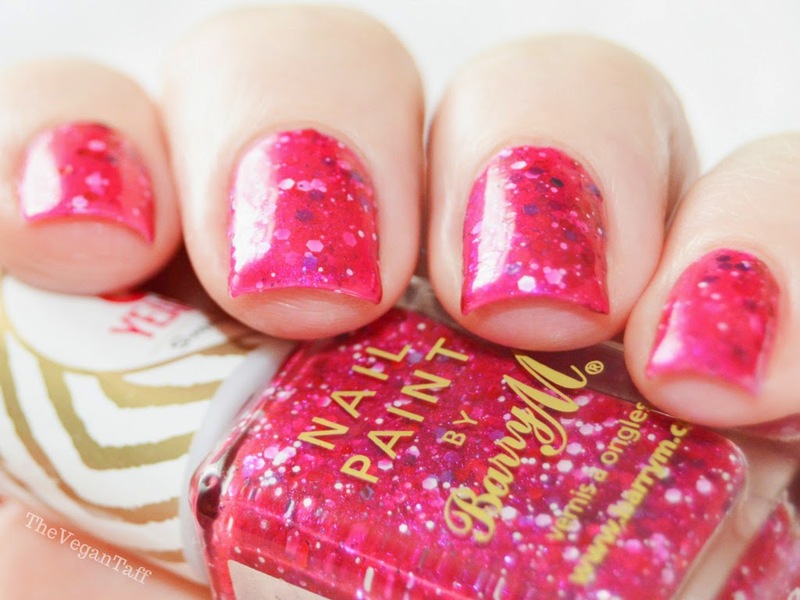 The polish is made up of white, red and purple hex glitters of varying sizes suspended in a fuchsia jelly base. I first wore this a couple of months ago, and have to admit to not being too keen on it then, so it went to the back of my stash and I forgot about it. But a few of the nail accounts I follow on Instagram were promoting #sparklesforayla, asking for people to wear pink sparkly nail polish and post the pictures in tribute of baby Ayla. This is the first polish that came to mind, and I'm so glad it did because I've totally changed my mind about it. The above photo shows two coats topped with Seche Vite. It dries pretty fast but is very uneven and not too shiny, not one that I would consider wearing without a self levelling top coat to even it out. With top coat though, I think it's really pretty and is one of the few polishes that makes me stare at my nails constantly. Barry M 50th birthday nail polish is available from Superdrug online and in stores nationwide for £2.99. What do you think of this nail polish, is it something you would wear?